PianoMaestro Teaching Aid Works On Any Piano | OhGizmo! If you’re learning the piano on a budget, companies like Casio have been selling electronic keyboards with follow-along light up keys for a while now. The only downside is that when you want to move on to something ‘grander’ you no longer have that help. But that’s exactly what makes the PianoMaestro system unique. 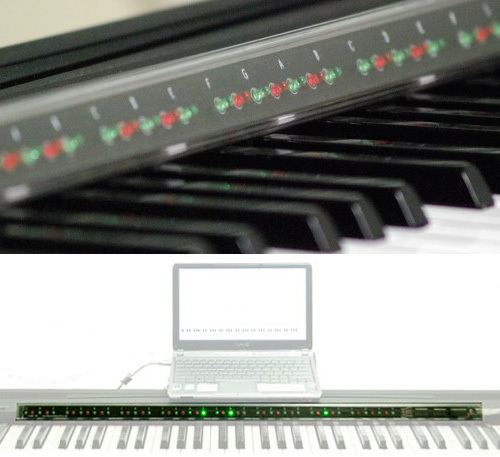 It’s a software/hardware combo that uses a long strip of LEDs that can be placed on any digital or acoustic piano, from a Casio to a Steinway & Sons. Once you’ve got it properly aligned so that the LEDs sit atop their corresponding keys on the piano, you plug it into your PC and load up the accompanying software which turns standard MIDI files into onscreen musical notation. The software is catered towards beginners so while a piece is being played back you can not only see what keys on the piano you’re supposed to play, but you can also limit it to just one hand’s part, and slow it down until you become more comfortable and proficient at playing it. At just $169 everywhere outside Australia (where it’s just $139) it’s far cheaper than years of piano lessons from a teacher. Though it seems to be lacking the one important thing you get from someone standing over your shoulder: discipline, you can find a happy medium by getting some extra instruction online via a piano tutorial at takelessons.com. This Piano Maestro system looks interesting. I may do a review of it on my site.